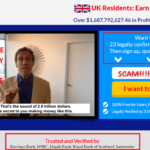 Pure Profits Software Review – Just Another Scam? Yes!! In today’s article, we will review one of the latest and most anticipating binary options trading software named as Pure Profits. And if you’re reading this article, that means you want to know whether it is a SCAM or LEGIT trading software right? Pure Profits software is a SCAM, and if you’re wondering to invest in it, then we recommend you not to do that. No doubt the presentation given by Jeremy whiskey is so convincing that anyone who is new in the trading industry will fall for it. Even at the first place we also get convinced by the presentation, but after analyzing everything mentioned on the website and demonstration video, we come to know that Pure Profit is full of fake promises and no one will earn a single dollar using it. In upcoming paragraphs, you will read about all the proofs by which we’re calling Pure Profits a SCAM. But first, why don’t you know a little about Pure Profits software and it’s owner. Pure Profits is an auto trader using which you can consistently earn a minimum of $800 every single day, and the good thing is that you don’t need to pay a single dollar or dime for using this money making machine. If you want, you can also use this software for free for first 90 days, and after that, if you want to continue using it, then you need to share 10% of your earning with them. Jeremy Whiskey is the owner and creator of Pure Profit app. According to him, he created this financial service five years ago with his partner. He mentioned emphatically, that, if you’re expecting that this trading software will turn you into millionaire just in a night, then you’re at the wrong place. But if you’ve some patience then just by starting with a minimum of $200 into your trading account you can double your returns every week. 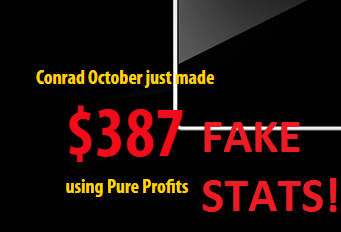 Lots of users who have become part of Pure Profits system already earning $800 every weekday. Even one of the member name Sophie, who started with $300, have made $6000 a month and while others shared a screenshot of 120,000 a month. Reasons Why Pure Profits App is a SCAM? In the pitch video time comes, when members of Pure Profits system start sharing their experience including the amount which they have earned using the app in last few months. 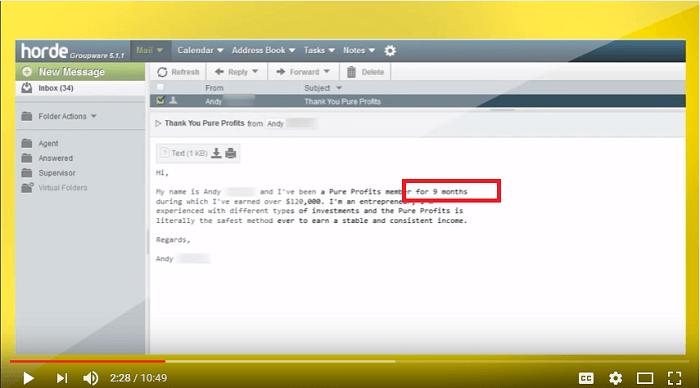 If you have watched that whole part, then Pure Profits member named as Andy share that he has made around $120,000 in last nine months. Now this is the fraudulent statement and proof of fake earning. We have checked the WHOIS details of the Pure Profits and found that the domain was purchased on 6 Jan 2016. Now if, the domain was obtained by the owners in January 2016, then which trading software Andy was using from last 11 months? So this confirms that this trading software is taking help of fake members to promote their alleged binary software. The identity of alleged Jeremy Whiskey is completely hidden in the pitch video or the official website. The only thing which we come to know about him is that he created this firm five years ago with his partners. While searching for him on the internet, we didn’t found any information about him or his financial service named as Pure Profits. If lots of users have earned considerable amount money using this trading software, then Mr. Jeremy must be a favorite guy, then why we’re not able to find any information about him? 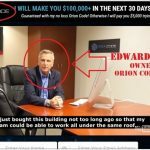 The truth is that this name is fake, and this fake binary option is maintained by the shady guy. In the demonstration video, it is mentioned by Jeremy Whiskey that there is no need to enter any credit card details to for testing this trading software for first 90 days. Now this is another fake promise, because when we decided to get our free copy it, the form forced us to add credit card details which is unfortunate and completely misleading. 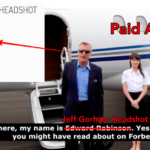 We have already proved that the domain of the website was purchased by the owners in Jan 2016, if this is real information, then about which financial service Jeremy is talking about in Pitch video of the Pure Profits. So this proofs also confirms, that something is wrong with this trading software. If you visit the official website of Pure Profits, then on the bottom right side of the screen you will see widget showing you numbers of the free copies available for the users. If you watch that spots counter carefully, it will show you 24 free copied, then suddenly the count start decreasing and get stuck to 2. It is part of pressure sale tactics so that more and more users create an account for Pure Profits. 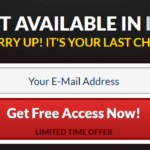 But the truth is that these free copies offer will never expire. To test this thing we launched the same site on a different browser and guessed what? Free copies refilled to 24 spots, Now if 22 spots were already filled in our previous session, then from where extra 22 spots appear mysteriously? 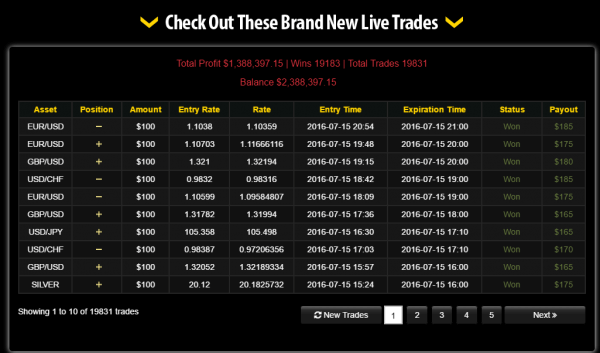 On the bottom left side of the website, you will see how many users have made money using Pure Profits. We have no doubt in our mind that all these names are fake and misleading. In the member area, you will see a section where you will see new live trades. Now if you’re into trading from a long time and check the apparently you will notice that all these stats are fake and used just to attract more users. In the presentation video on the website homepage, Jeremy mentioned that you could start trading with $200, but if you reach the member area and listen to the instruction provide by him, then here he is mentioning that you need to start with $300 deposit in the trading account. Now this is another misleading information. 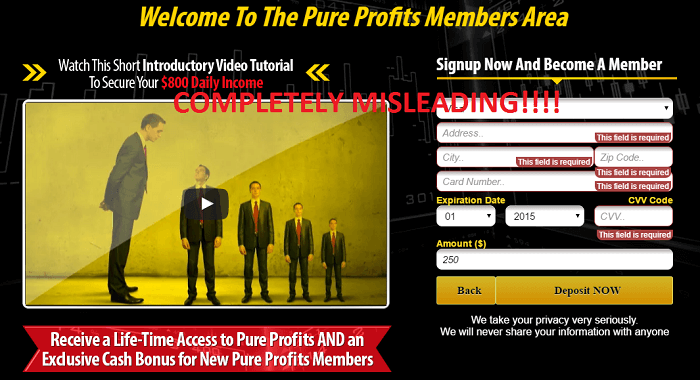 Pure Profits is One of the Worst and completely misleading trading software with lots of fake promises. Even there is not a single thing which makes any sense. So we recommend you stay away from it. 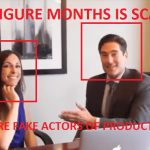 7 Figure Months is a SCAM – Genuine or Another Scam? Thanks for exposing this scam software. I was about to trade via Pure Profits.